I am a sucker for a good burger and a cartload of fries. Whenever I am in need of some comfort (also hangover) food, this is exactly what I go for. When I first moved to Berlin it was rather difficult, in my opinion, to find a burger and fries which really hit the spot. It can be even more difficult to find a burger joint that do a decent veggie burger, that is, one that is not a soggy, greasy mess. It is hard to convince people that a vegetarian burger is worthy of the status when lumps of carrots and peas in a bun is your only defense. All that is changing now though and Berlin is becoming a burger heaven. I have a list of burger places that I want to try because I am a nerd in certain ways. Yesterday, I ticked Tommi’s Burger Joint off my list. The vast number of good reviews, and its closeness to where I live, had put this place on my want list since the day it opened. I was also attracted to its old school McDonald’s menu. As you can see from the picture below, there are not many options on offer at Tommi’s. This is not a problem though as what is lacking in choice, is made up for more than enough by the quality of the food. This is not a picture of the Berlin menu. However, the prices are more or less the same. 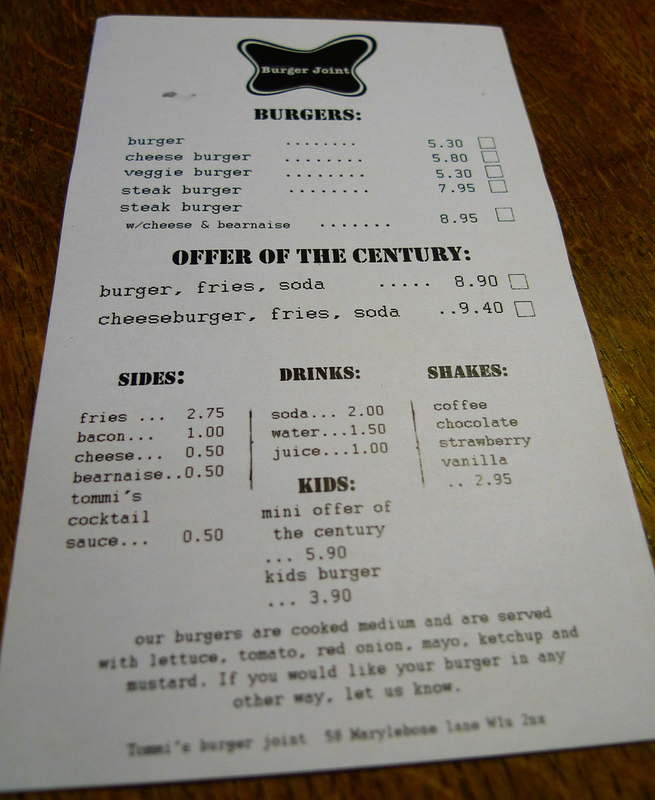 The Berlin menu can be viewed at http://burgerjoint.de/. Photo via FlickrCC. When ordering, I was told that the veggie burger being offered was not the usual one, but tasted equally as good. Considering I had never tasted the regular burger, this was no problem for me. Fries and cola were also naturally ordered and the whole lot came served casually in a basket with a helping of cocktail sauce. The addition of cocktail sauce immediately brought a smile to my face as I have only ever found that delectable treat in Ireland. The skinny fries were equally tasty although nothing mind-blowing. Certainly the best fries of that kind I have had in Berlin, but for me, nothing beats a hand-cut, thick fry. However, one bite of the burger and it jumped to my number one veggie burger of all time! It was absolutely amazing and I have not stopped thinking about it since. It took me a few bites to decide what it reminded me of – a cheese and onion pie from the chip shop back home! Right, I have no confirmation that it was exactly this, but my taste buds told me that the patty was filled with creamy potato, cheese and some type of seasoning. It was incredible! The tasty soft bub it was placed between was a winner also. My boyfriend was with me and he had the cheeseburger with added bacon. Another winner! He really enjoyed the simple but tasty treat. I don’t have a picture of the veggie burger. Sniff. 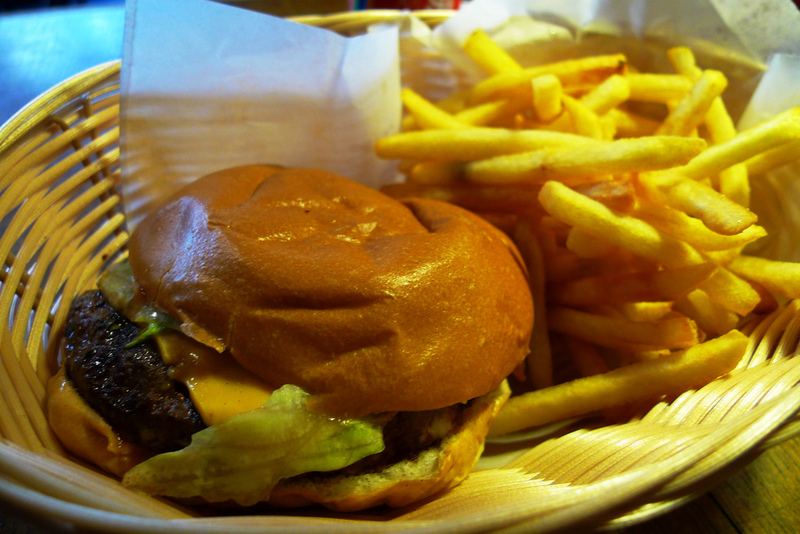 But here is a picture of the delicious cheeseburger. Photo via FlickrCC. I really cannot rave about Tommi’s enough. The food was great, the restaurant was cool and the people were friendly. I most certainly will be stopping by here again and look forward to seeing what their regular veggie burger has in store for me.